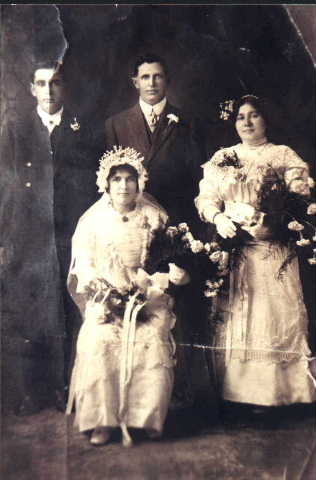 This slightly weathered wedding photograph is of my Great Aunt (seated) and Great Uncle (standing on the left). They are Maria Pacheco (aka Mary Pacheco Smith) and Anton Souza. Maria and Anton are better known as Nanny and Dean. Maria’s parents were Theodoro Pacheco and Maria de Braga. Anton’s parents were Augusto de Souza and Francesca de Mendonca. Both Maria and Anton were born in Kilauea, Kauai, Hawaii. Also in this photograph are my Great Great Uncle, Jose de Braga, and his wife, Maria (Camara) de Braga. My Great Great Aunt and Great Great Uncle were also known as Joe and Mary DeBraga. (Isn’t anyone known by their real name?) Jose was Maria (de Braga) Pacheco’s brother. Maria and Anton got their nicknames when my Uncle, Donald Smith, was a toddler. He had a speech impediment. Nanny and Dean were his Godparents. He had trouble pronouncing the Portuguese words for Godmother (madrinha) and Godfather (padrinho), so they became Nanny and Dean. The names stuck. Though Dean died fairly young, Nanny lived on into her 80s. Everyone who knew her knew her as Nanny–she was just the type! Maria was just 16 years old when the couple married on the 4th of July in 1914. The groom was 24. They were married at St. Joseph’s Church in Oakland, Alameda Co., CA. 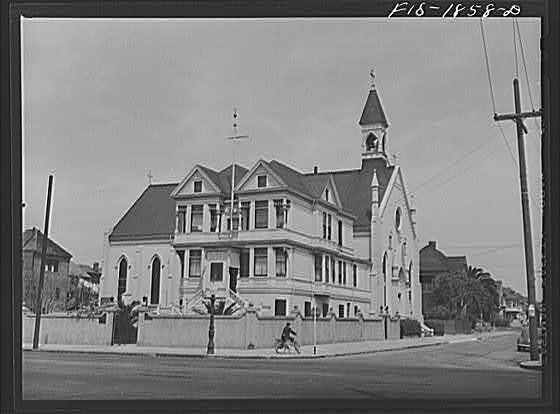 St. Joseph’s was a Catholic church that served the Portuguese community of Oakland. It was located at 17th and Chestnut. If I am not mistaken, St. Joseph’s was merged with St. Andrews parish.